There are few sounds like that of a mother crying over her child. A heart-broken mother, a terrified mother, a lost, angry, confused and wounded mother holds nothing back but weeps out grief in anguished sobs that come from deep within her DNA. How could this be His plan? The pain can so overwhelm and consume us that for an instant we feel we have lost the presence of God. Perhaps it is a shadow of how Jesus felt on the cross when He cried out “My God My God! Why have you forsaken me?” (Matthew 27:46 NIV). The first time I became pregnant, it ended in a miscarriage followed by several years of nothing. In the end, the tests the doctors put us through led them to believe a pregnancy was extremely unlikely. Now for me, and maybe for most women, I may not have ever known for sure what my future looked like in terms of where I’d live, who I’d marry, or what I would do. But I always knew I’d be a mother. Most little girls, from the time they are old enough to imagine the future, believe they will be mothers. It is almost impossible to see it any other way. When that was taken away from me, it shook the foundations of everything I believed. I felt I had lost my identity. A few years passed. My husband and I had accepted this. Our marriage was stronger for having gone through it and we were at peace. And then I found out I was in fact pregnant. With twins. In my mind I thought since I had miscarried the first time, how could I possibly have a successful pregnancy carrying two babies. I began worrying, fretting, crying. I feared and imagined the worst. One day I went for a walk and as my thoughts spun and the fear crept in, the Holy Spirit prompted me to say thy will be done. 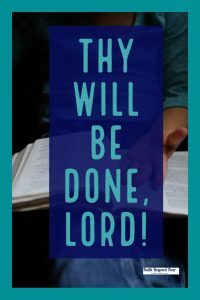 Just thy will be done, Lord. The message was so clear. Acknowledge the Sovereignty of God, open my hands, and entrust the longings of my heart to the One who created me with those longings. All my worrying and fearing would not bring about a positive outcome. I could either let it consume me and steal my joy for whatever time I had, or I could enjoy these moments. For however long this pregnancy lasted, I was a mother. I couldn’t see them, but I had babies to take care of. These were the moments I had been given. This became a beautiful, peace-filled time for us. My daughter and son arrived five weeks early, but for the most part healthy. Life was good. Fast forward sixteen years. We came home one night to see our front door standing open, my son and his belongings gone. And so began one of the most painful periods of my life. He came home, but a darkness came with him. It overtook our home, our lives. There was hurt and anger, and if I’m honest, fear. Several months into what felt like a climb up out of Sheol itself, I sat on my bed one night and cried, which wasn’t unusual. I cried a lot during that time. But this time felt like I was in mourning. My son had distanced himself from me until there was almost no contact at all. He felt lost to me. The precious little boy I had known had been replaced by someone I didn’t even recognize. And in that moment, it didn’t feel like I would ever have my son back. Again, the Holy Spirit reminded me to say thy will be done. That night was the moment I quit trying to fix it all myself. I released my son to God, understanding I had never been the one holding him anyway. And God took my fear—my fear I would fail my son in this—away. I’m not saying I didn’t still worry about him, that there weren’t moments when fear didn’t creep back in. But there was always the knowledge that my son was being held by the hands of the One who loves him even more than I do. I had submitted this all to God’s plan and timing, and I had stepped out of His way to let Him do what He needed to do to take my son on the path He had for him. It freed me up to pray for my son. My prayers were no longer double minded “yes I’m asking you to do this God, but in case you aren’t going to handle the way I want, I’m going to keep working on it myself.” Again, I entered into a time of my life that was beautiful and full of intimacy with the Lord. I won’t say it was always peace-filled, but a peace overrode every event that came our way. Something solid existed beneath our feet when the storms came. It didn’t happen overnight, but our son did come back to us. Through God’s great grace and mercy, our relationship has been restored, and our son is doing well. 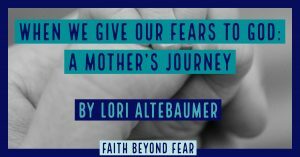 When I leaned on myself and counted on what I could do for myself, fear was a destroying, paralyzing monster. 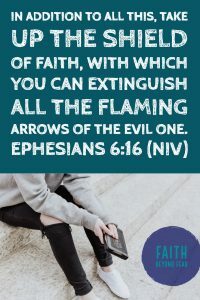 But when I turned what I couldn’t fix or change over to God in faith, fear lost its power. When I stopped focusing on my fears, God showed me what He could do. God did not force His faith upon me. He told me to take it up as a shield. Love is truly the only thing strong enough and powerful enough to overcome fear. Loving others, but more importantly accepting and believing in God’s infinite love for us. Believing God loves you strengthens your faith. And it is this faith that will carry you beyond your fears. 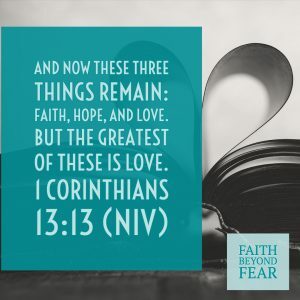 What steps can you take to put your faith in Christ ahead of your fears? A life-long Texan and a graduate of Texas A&M, Lori lives in a small, rural community with her husband, two dogs, and a cat. She is the mother of twins and a recent empty nester. 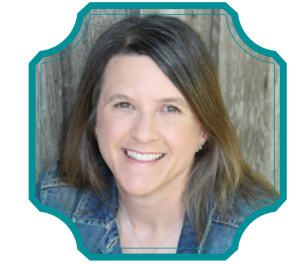 After spending years working in administration and marketing for her husband’s business, Lori now writes full time, using her love of words and story to educate, inspire, encourage, and entertain. She blogs regularly on her website at www.lorialtebaumer.com. She can also be found on Twitter, Instagram, and on her Facebook author page, LoriAltebaumerWrites. I totally understand everything you wrote here. I appreciate your heartfelt words. Learning to let go and trust God and pray brings so much peace. My sons have struggled with addiction so I can relate to your experience. Thank you. Thanks, Lori, for writing this message of hope. To parents who have prodigal sons or daughters, you have given us a nugget of gold to hang onto as the battle for their souls rage. Thanks for reminding us that God’s got this and that we can trust in His unseen hand because we know He is loving. Diana, I’m so sorry to hear you are walking through a season with a prodigal child. I know the pain is indescribable. I found myself doing a great deal of reading things written by others who had gone through this. I received a lot of strength and comfort–and even peace–from the book Prayers for Prodigals by James Banks. When I didn’t know what more to pray, the prayers in that book gave me focus. I will be praying for your situation. Keep your faith in God’s ability to do immeasurable more than all we can think to ask of Him. My husband and I lost 2 babies to miscarriage before conceiving our daughter. I imagine my love would have been strong for both of the first two babies but I can only speculate. I feel like the loss of those two made me have a greater appreciation for the role of mother I was blessed with. I know there will be many things I will have to face as her mother, but with God’s help I can do it. Great post. I have often thought the same thing…that because of my miscarriage I have a much deeper appreciation for the miracle of child birth and a much greater sense of humility and thankfulness for what God has done. And yes, we will continue to face so many things on this walk as a mother, but knowing to turn to God for His hep in ALL things makes the difference! Thank you for sharing and blessings for you and your family. Thanks for the post, Lori. I have had lots of moments as a father where I have worried about the stage my kids are in. I have stressed and strained against where they are and begging God to intervene. Much like you, God told me to let him tell their story. He’s the author of our faith after all. Your words are full of wisdom, and I’ve been learning and growing in their lesson for 10 years and will for decades more. Thanks for sharing! Chip, parenting has brought me closer to the Lord and given me understanding in things I never would have had otherwise. My kids are grown and married now, but the lessons never end…nor would I want them to! Thank you for your response.